Lodge Logic Sizzlin’ Potatoes on the Grill – Mmm, mmm! 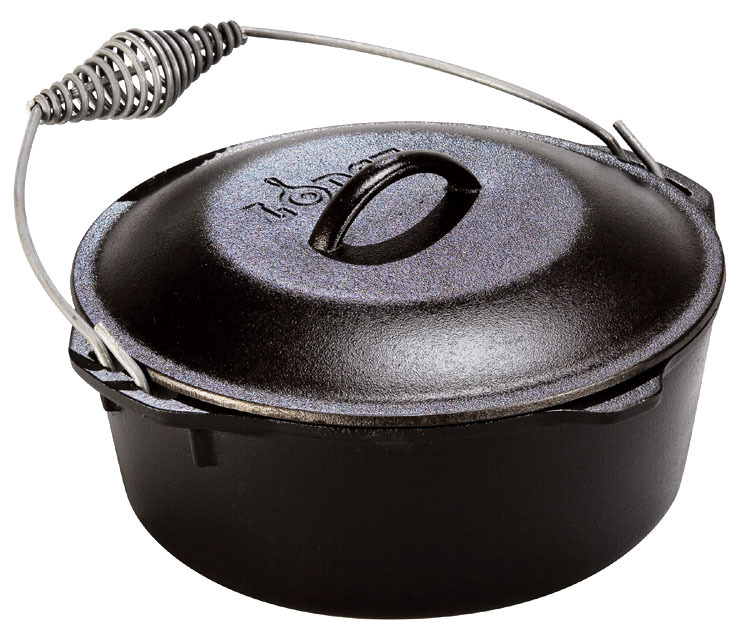 We’re wrapping up our celebration of Made-in-the-USA products this month by touching on the leader in cast iron cookware, Lodge Manufacturing Company. Joseph Lodge established his foundry in 1896 in South Pittsburg, Tennessee, and since the beginning, Lodge has been family-owned and operated. Lodge produces high-quality cookware that will literally last a lifetime, and then some. Skillets and Dutch ovens that were made over a hundred years ago are still being put to good use in kitchens all over America. Cast iron is among the most versatile of cookware… on the range, in the oven, under the broiler, and even on the grill and over open flame. And in our opinion, a cast iron frying pan is a must-have for every kitchen! Originally developed in China in the 6th century, B.C., cast iron was at first used, among other things, for weaponry, pots, and as a building material. Estimates vary for when cast iron became popular in the West, but it can trace its culinary roots at least as far back as the 1400’s. Sixteenth century immigrants left plenty behind as they ventured forth to new lands, but they seldom left behind their cast iron cookware. It was deemed so valuable that many people – including George Washington’s mother – designated a recipient for their cast iron in their will. Burgers, potatoes, and buns, oh my! Cast iron lets you cook anything on the grill, and the heat retention and distribution make for perfectly charred meats and veggies. Cast iron is incredibly durable and able to take extremely high temperatures, which makes it great for the grill. Use a skillet to brown your burgers to perfection at your next summer party, or for crispy grilled potatoes with that fantastic black char you can only get with cast iron. Cast iron cookware has become so popular, there’s a pan available for almost every application. One of our favorites is a Dutch oven. This heavy lidded pot can be used in the oven for roasting veggies or meats, or even for baking bread. We particularly love using ours to roast a whole chicken for dinner. It can also be used right on the stove-top for frying or almost anything else – we’ve made everything from burgers, bacon and chicken to Indian curries and mixed veggies, all perfect every time. Soups and chilis are particularly good in a cast iron Dutch oven. The even heat diffusion and excellent heat retention mean that the soup is being cooked evenly and from all sides, instead of just from the bottom. We love hot chili in the summer – the spice helps cools us down! Our own Dennis was happy to share his recipe with us, and we can’t wait to try it. 1 tbsp chili powder, or more. It ain’t rocket science. ¼ cup Dijon mustard – go nuts and try whole grain! 1 can Italian plum tomatoes – the big ones! That’s all you NEED. But this is America, so feel free to add more. Heat olive oil in a large pot and add those onions. Let those little boogers cook and stir them a bit until wilted. It is a lot of onions, so maybe 10 minutes. While waiting, pour yourself a glass of wine. Add ground beef and stripped sausage to that medium to high-heat pot. Let the meats brown slowly… watch the heat. Now comes the fun… spoon off the ugly fat. No one wants it. Great things coming: Stir in the tomato paste, garlic, cumin, chili powder, lemon juice, mustard, basil, oregano, oh yeah, and let’s not forget the salt and pepper. That was a lot of stuff – did you get it all? Stir well (whatever that means) then add the tomatoes and kidney beans and stir even more. Let this pleasure simmer uncovered for 15 minutes. Add olives and simmer for five more minutes. When you’re ready to serve, stir in the parsley and dill. This can be served with rice or corn bread. If you’re feeling adventurous, put it on hot dogs and sprinkle it with cheddar cheese. Lodge Logic Cast Iron Reversible Griddle – great for everything from steaks to pancakes! Stop by the store this Saturday from 11 to 3, to get a taste of this sizzlin’ hot chilli from Dennis himself, who’ll be serving up samples. We’re offering a fabulous giveaway this week: this beautiful Lodge Logic Reversible Cast Iron Griddle. 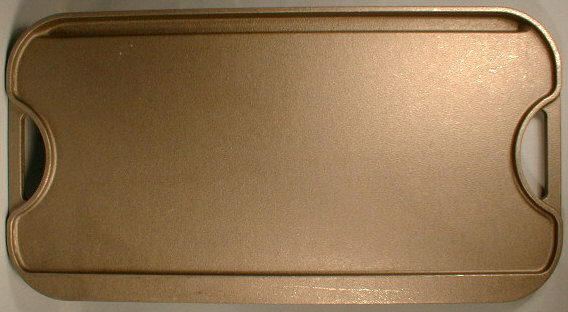 The 20″ x 10″ griddle is smooth on one side and ridged on the other. Use the smooth side for eggs or pancakes, and the ridged side for indoor or outdoor “grilling”. With a retail value of $72, this is a fantastic prize, free to one lucky winner of our weekly drawing. And finally, we even have an extra special sale to top off Made-in-the-USA month: This Saturday only, all Lodge products purchased in-store are 10% off. That’s one day only, so don’t miss it! We hope you enjoyed Made-in-the-USA month at Fante’s! Although July is over, we sell plenty of American-made products all year round – much more than we had time or space to feature! Look for the American flag on our website and in-store. Thank you for reading this month! See you this Saturday!